Can community collaboration create a new vision for a neighborhood? The success of a design charrette with the Tennessee Chapter of American Institute of Architects (AIA) showed that it can. AIA Conference attendees came to Glass Street for a hands-on workshop that combined architecture, urban planning, design, and the experience of local residents. 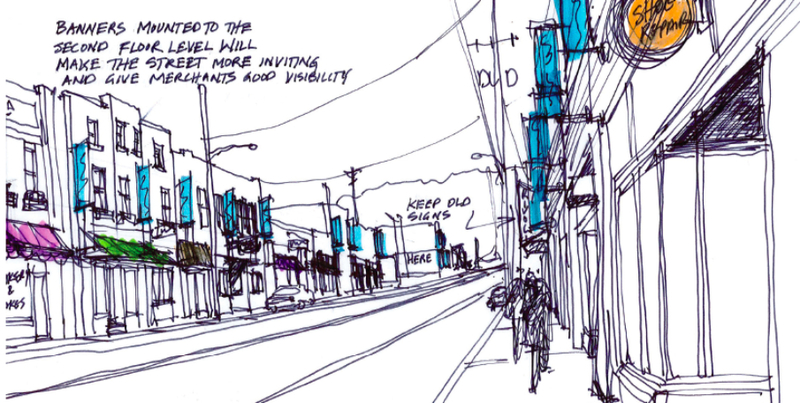 The teams had three hours to explore the Glass Street area and develop near-term plans for revitalization. Ideas included capitalizing on the increased foot traffic on Sundays to create the “Glass Street Gospel”; rehabilitating a nearby creek to provide green water reclamation; and extending the “safe street” zone near the elementary school to the business district. Teams also suggested using green space to engaging local families and pedestrians for public gatherings such as performances, farmer’s markets, parks, shade trees, playgrounds, a community garden. The eight plans will be shared and discussed with East Chattanooga residents, who will refine and build on the schemes presented to create a district-wide streetscape and public space plan that will provide a roadmap to a brighter future on Glass Street.